Far left, white T-shirt, Burl Bushman. Center, sanding shelves, Stirling Broadhead. Behind and to Stirling's left is William ("Whistling Bill") Snell. Right foreground, Douglas Thayer. Young man in white shirt and vest, not yet identified. Special thanks to Burl Bushman for providing this historic photograph. 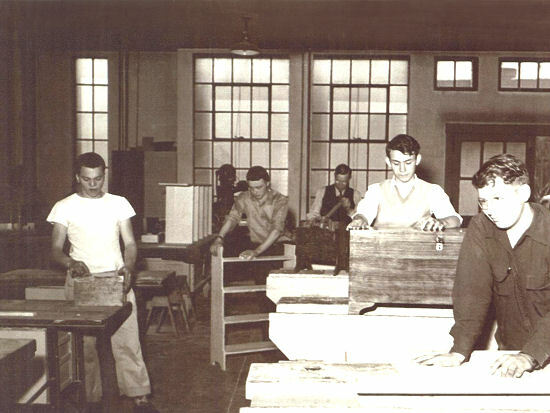 During the fall of 1944, our Brigham Young High class took a woodshop course on the upper campus. Our teacher was William H. Snell, Instructor of Mechanical Arts, who taught on our campus from 1915 to 1957. During the first few minutes of every class Mr. Snell gave us oral instructions and directions, then we would begin our woodworking projects. As we commenced working, several of us began to whistle tunes, not loud ear-piercing whistling, but just some simple tune that we knew. We figured whistling while working was just as normal as reading while eating lunch, and didn’t bother anyone. Oh, how it bothered Mr. Snell! He gave us explicit instructions: there was to be no whistling in his class. We just could not understand his attitude. Even the Seven Dwarfs whistled while they worked. In fact, their songs may well have provided some of our whistling tunes. Here we were, working in a shop where there was hammering, sawing, planing, chiseling, sanding, drilling, etc. -- a shop just full of noise -- and it seemed only the whistling bothered Mr. Snell. At times, one of us would forget Snell's Mandate and just begin whistling out of habit while we focused on our project. In a flash Mr. Snell would appear at the whistler’s work bench, sternly reminding the offender of Rule #1. Whenever he left the shop for a few minutes, that became our free whistling time, but the instant we saw him return we all fell silent. One day he returned to the shop through a different door than the one from which he’d left. He heard some whistling, and we were caught. His reprimand included some extra clean-up activity in the shop after class. It was no big deal and we accomplished it in a few minutes. In the shop was a large anvil. We eyed it carefully, wondering what might be done with it by way of mischief. Then a few weeks prior to the Christmas break it came to us: When no one was looking we unbolted it from the bench, carried it outside and heaved it in the bushes next to the building. The large anvil was now totally hidden from view. For a number of class periods after that, we heard Mr. Snell mumbling now and then about who might have taken the anvil, with no idea of who the culprits might be. We were confident that the groundskeeper, sooner or later, would find the anvil and return it to the shop. 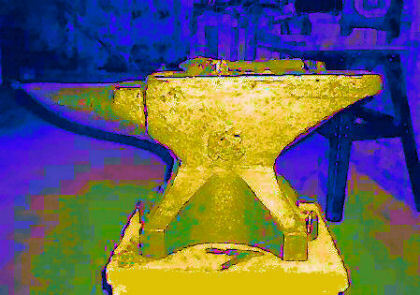 However, after Christmas break we noticed the anvil was not yet back on the bench. We surreptitiously took a look in the bushes where we’d dumped it, and noticed that the great chunk of iron was beginning to develop some serious rust. One day when we knew the coast was clear, we worked together to lift the anvil, and returned it to the same place from which we’d unbolted it. There wasn't much time, so we simply returned it to its place without bolting it to the bench, to minimize the risk of being caught "red-handed" -- and we quickly washed our hands and arms to remove the tell-tale evidence. We were certain Mr. Snell suspicioned that it was someone in our class who had taken the anvil. But to our surprise, he did not question us. Perhaps he was simply so happy the anvil was back it its place, even in its rusty condition, that he did not wish to open the book on "Why." Written May 2005 as an act of puckish penance. Haud magis whistling dum vos opus?